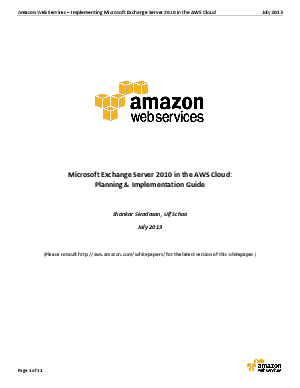 > Amazon Web Services, Inc > Reduce Costs and Run Your Microsoft Exchange Server on Amazon Web Services Cloud. This guide discusses planning topics, architectural considerations, and configuration steps to run a high-availability and site-resilient Exchange architecture. This guide is designed for Microsoft Exchange Server administrators, architects, and engineers. In the guide, we also provide a sample AWS CloudFormation template that is designed to help you easily provision the necessary AWS resources and update them in an orderly and predictable fashion.